It starts with the intention to make molded clay animal cracker pins to raise money for Cabrillo College’s Ceramics program and ends with….ceramic animal cracker pins that do just that. But the journey is the interesting part. Not the noun what, but the verb how. Let’s enjoy the fascinating loop-de-loops, curious sidetracks and obtuse angles to get there, learning a thousand things that don’t work on the way. At first, testing to find the best approach:Which clay? Body stain or not? Oxide washes? Underglazes? Glaze? Testing, testing, testing. Always comparing the results to a real sample, which is surprisingly ORANGE toned. 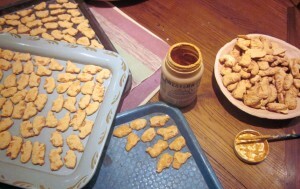 Important, too, are the molding methods and whether or not to add any clear glaze. 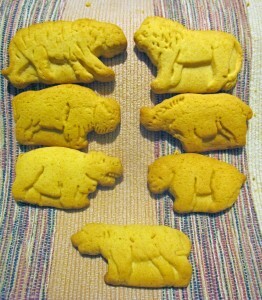 (In this case, no, unless you want frosted animal crackers!) What you see above are the first efforts, which admit a bunch of possibilities, most of which prove unsuitable. Next slide, please! The Final Four Finishes Favorite with an added toasty edging. Could anyone guess the real ones from a random grouping of clay? In this shot the real ones are turned over, but most could not distinguish among the lot beforehand. The closest guesser noticed the excess material at the mold’s edge, not the applied colors. The job ahead was clear: make neat moldings and color them well. And that’s what I did. 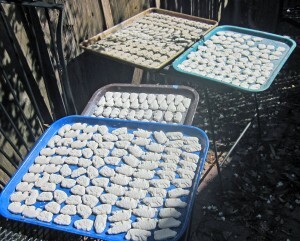 Nearly four hundred crackers, pressed and molded neatly. Over twenty of each kind! 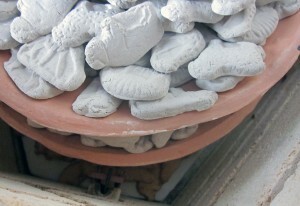 And bisque fired in several tumble-stacked layers. 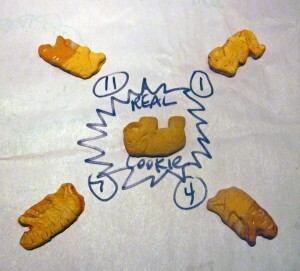 Most of the animal cracker shapes were clear: Lion, Giraffe, Gorilla, Koala. But there was one Mystery Animal. That’s the cracker at the bottom of this photo. Was it a pig? A big dog? A lactating mammal with gills? It provoked a lot of feedback and speculation to my Facebook query. 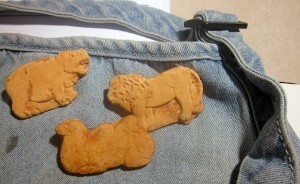 But the definitive list of official Nabisco Animal Crackers appeared from a Friend, identifying it as….. a hyena. Really? Ah so. 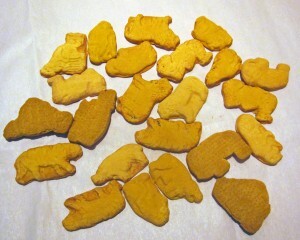 We also learned that the older molds from older crackers were larger and more detailed than the fresh-out-of-the-box-this-week cracker molds. Ah, profitability. 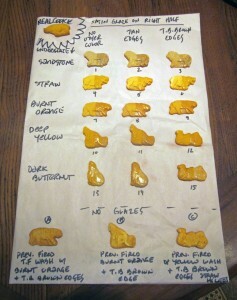 The task at hand: to color and glaze fire the collection. The sheer volume is daunting. Time to put tailbone on the stool and just get it done. And the first fired round turned out too dark and blotchy! At least with low-fire clay and underglazes, an artist can just re-apply the lighter color treatment and refire. A burnt cookie is a burnt cookie, but a burnt clay cookie mostly just needs color adjusting and refiring. That’s what you see in the shot above, lightening each one to send back into the kiln once again. With a successful RE-firing, it’s time to glue on the pin-backs. Long live E6000, or at least its smell. 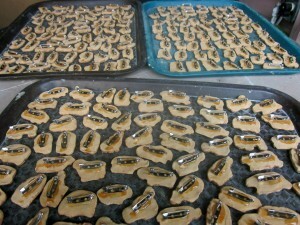 A few fully formed, fired, re-fired and fitted animal cracker pins for fabulous fund-raising. –Liz Crain, who thinks a curiously tenacious work ethic, a few laughs, and raising funds for Cabrillo College’s Ceramics Program are definitely worth the kink in her neck from hours in the same intent position.